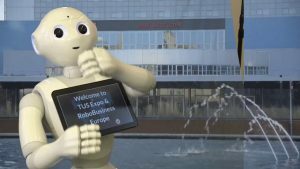 RoboBusiness Europe is all about exploring exciting innovations in robotics. The speed of innovation has never been faster. More powerful silicon chips, digital sensors, and high-bandwidth communications are advancing robotic technologies and applications. RoboBusiness on April 19-21 in The Hague, is the place to meet meaningful contacts and gain insights on the latest developments. The event’s program is designed to provide invaluable information and create powerful connections. RoboBusiness Europe is an exclusive opportunity to engage with experts in the robotics market. It will focus on the hottest topics addressing all the key challenges. Come and meet high level business contacts. Also network face-to-face and build invaluable partnerships. Look here for the complete programme. The venue will be at the World Forum The Hague.